DEARBORN, Michigan – Denis Leary, the comedian who does double-duty as the voice of the Ford F-150 pickup truck, is showcased again in a new advertisement set to debut during Fox’s NFL coverage on Thanksgiving Day. This time, Leary touts the 2016 F-150’s Pro Trailer Back-up Assist Technology, which is designed to make backing up a trailer easier. The new ad, dubbed “Brainstorm,” describes the F-150 as “freakish” on trailer back-up. 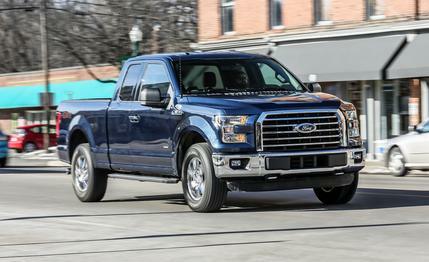 The Texas Auto Writers Association named the F-150 back-up technology as the “Best Technology” of the year in October. The back-up assist also took home honors from the Consumer Technology Association in its recent “Best of Innovations Awards.” The F-150 technology won in the “vehicle intelligence” category. Towing and high-tech features are a huge component of the decision for truck buyers. Nissan just released a new video, called “Making the Grade,” as part of its 2016 Nissan Titan XD Truckumentary series that highlights the towing and merging capability of the redesigned truck. The F-150 also competes against the Chevrolet Silverado and Ram 1500. Edmunds says: Leary is more straightforward than smart-alecky in this new F-150 ad, which is expected to educate consumers about the benefits of this segment-leading technology.